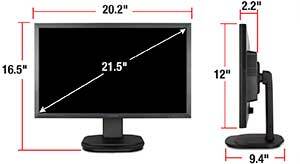 The VG2239m series widescreen monitor is one of two members of ViewSonic's VG39 family. Its 22" display with a native 1920 x 1080 resolution is big enough to replace dual monitor setups. What makes it even more appealing is the LED backlight for up to 50% energy savings. Monitor is also fully ergonomic with 90º pivot, height adjust, swivel and tilt. The slim bezel design coupled with hidden stereo speakers make the VG2239m a space saver.The VG2239m-LED features DisplayPort, DVI-D digital, and a VGA analog input. You can connect multiple sources at the same time and then toggle between them by selecting the input source through the On-Screen-Display (OSD). You can also connect one of your computer's USB ports to the monitor's USB uplink input which then multiplies the USB ports to two. This way, you can connect your keyboard / mouse or other peripherals to your monitor directly and save yourself from the hassle of reaching for your computer's USB ports. The VG2239m-LED is equipped with DisplayPort digital interface, which transmits both audio and video signals through a single connection to deliver ultimate versatility and performance. DisplayPort supports all kinds of multimedia devices for convenience in video production, graphic design and more. The VG2239m-LED is an ergonomically designed tool that maximizes comfort and productivity. Based on your height, chair and desk conditions, you can adjust the monitor up or down 5.3”, swivel it 360 °, or tilt it 20 °, whatever makes you more comfortable. Also, when designing a portrait mode image or a document (such as a flyer or a magazine page), you can rotate the monitor 90° and utilize your 22" (21.5” viewable) screen size at its full extent. You can also adjust your graphics card settings so that all your graphics are rotated 90°as well. The VG2239m-LED features DisplayPort, DVI-D digital, and a VGA analog input. You can connect multiple sources at the same time and then toggle between them by selecting the input source through the On-Screen-Display (OSD). You can also connect one of your computer's USB ports to the monitor's USB uplink input which then multiplies the USB ports to two. This way, you can connect your keyboard / mouse or other peripherals to your monitor directly and save yourself from the hassle of reaching to your computer's USB ports. One of the great features of VG2239m-LED is its ability to dim the backlight completely for pure darkness during dark scenes, such as a night shot in a movie. Contrast ratios refer to the ratio of the brightest color to the darkest color. With traditional CCFL backlit displays, contrast ratios are limited to the fluorescent lamp's ability to dim, in order to reproduce darkness. However, with the LED backlight, each LED has the ability to completely shut-off allowing for a near infinite ratio of black to white contrast. The end result is true blacks that result in greater overall image quality. The VG2239m-LED features a 22" (21.5” viewable) widescreen with 1920x1080 resolution that is capable of displaying a native Full HD 1080p image. Today, devices that can display Full HD content output are getting more and more common. However, without a native Full HD display, you will not be able to experience the picture clarity and the details of the 1080p content you view. 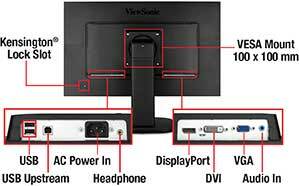 One of the key advantages of the VG2239m-LED monitor is its diverse connectivity options, making it flexible to be paired with a PC or a Mac computer. Now you can hook up any ViewSonic PC as well as a MacBook or a Mac Mini to the VG2239m-LED and enjoy a widescreen with LED backlight! The VG2239m-LED features a 100mm x 100mm VESA mountable design that allows you to mount it on a monitor stand or on a wall, depending on your specific needs. You can detach the base easily by unscrewing four screws and then mounting the display on its new stand or wall mount. 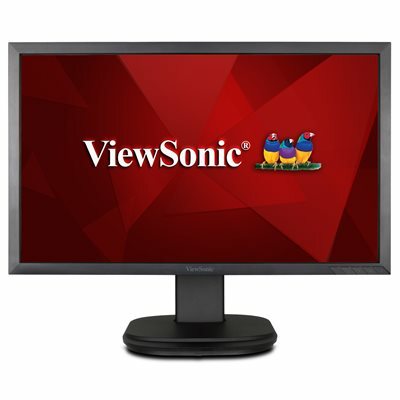 ViewSonic’s proprietary Eco-mode function comes standard with the VG2239m-LED. When you don’t need all of the power the VG2239m-LED has to offer, you have the option to reduce the monitor’s brightness, save energy, save the planet and prolong the lamp life. You can select one of the “Optimize” or “Conserve” options and save up to 35%* energy. Especially under low ambient light conditions, adjusting the brightness will improve visibility by reducing eye fatigue. Reducing brightness will also prolong the monitor’s lamp life, improving your return on investment. With its mercury-free backlight and low energy consumption, the ENERGY STAR certified VG2239m-LED saves your electricity bill. The savings of LED can add up to thousands of dollars saved for large install bases, such as big corporate buildings or schools. The savings can be as dramatic as $20,000 in five years! The ViewSonic VG2239m-LED widescreen monitor provides native full HD 1920x1080 resolution, and 20,000,000:1 MEGA dynamic contrast ratio for stunning display quality. The VG2239m-LED also offers the latest in DisplayPort technology for easy data transfer of high-definition video and audio. Other connectivity options include DVI and VGA inputs, a two-port USB hub for peripheral support, and integrated speakers to complete the multimedia package. Additional features include a matte finish slim bezel design with full ergonomic functions, including 90-degree pivot, height adjust, swivel, and tilt for maximum screen viewing. You can put it on your desk or mount on your wall or on any VESA-compliant monitor stand. In addition to all these impressive features, the VG2239m-LED also provides for super low TCO, with ENERGY STAR and EPEAT Gold certifications, and up to 50%* power consumption savings over traditional CCFL displays. *Energy savings may vary based on cost, actual usage and other factors. Specifications and availability are subject to change without notice. Selection, offers and programs may vary by country; see your ViewSonic representative for complete details. Corporate names, trademarks stated herein are the property of their respective companies.